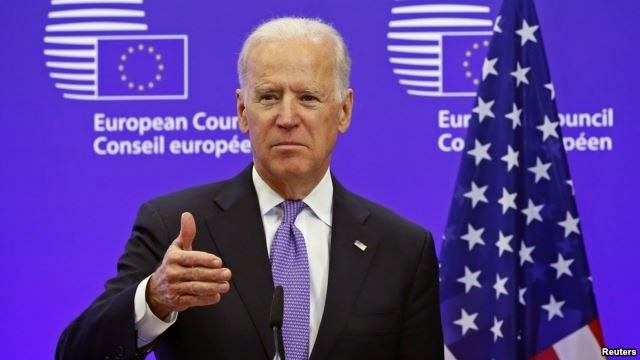 BRUSSELS, Belgium -- U.S. Vice President Joe Biden has said Ukraine is battling for its “very survival” in the face of escalating Russian involvement in the conflict between government forces and separatists in the country’s east. U.S. Vice President Joe Biden speaking at the EU Council headquarters in Brussels. Biden made the comments on February 6 as German Chancellor Angela Merkel and French President Francois Hollande pressed forward with a new peace plan to end the Ukraine crisis. Speaking alongside European Council chief Donald Tusk in Brussels, Biden said Russia "cannot be allowed to redraw the map of Europe." "This is a moment where the United States and Europe must stand together, stand firm," he said. “Russia continues to escalate the conflict by sending mercenaries and tanks," Biden added. Tusk said, "The European Union and the United States need to continue standing shoulder to shoulder, coordinate our efforts, and uphold the pressure on Russia for as long as necessary." "We cannot compromise on Ukraine's independence, sovereignty, and territorial integrity," he added. Merkel and Hollande head to Moscow on February 6 to discuss with President Vladimir Putin a peace plan to end surging separatist violence in the east. No details of the plan have emerged, but Ukrainian President Petro Poroshenko said talks with Merkel and Hollande in Kiev on February 5 raised "hope for a cease-fire" in eastern Ukraine. Ahead of her departure in Berlin, however, Merkel played down the chances of securing a truce. "We don't know whether it will happen today or if further talks will be required,” she told reporters on February 6. “We don't know if these will be short talks today in Moscow or long ones, or if they will be final talks." "As German chancellor I would never, over the head of another country, in this case Ukraine, get involved in territorial issues." In Paris, Hollande said he was heading for the talks with Putin with the aim of reaching an global agreement to end violence in Ukraine. "Everyone knows that the first step must be a cease-fire, but it is not enough," he said. "We must get a comprehensive agreement." The duo visited Kiev on February 5 in the biggest push yet to resolve the ten-month conflict, which has killed more than 5,350 people since April, 2014. In Moscow, Putin aide Yuri Ushakov said the Kremlin expected that Merkel and Hollande had taken the Russian president's own peace proposals into account. Ushakov said Russia was "ready for a constructive conversation" aimed at stabilizing the situation, establishing a dialogue between the Ukrainian government and the rebels, and rebuilding economic ties between eastern Ukraine and Kiev. Ukrainian Prime Minister Arseniy Yatsenyuk said Kiev would not consider any peace plan that casts doubt on the nation's territorial integrity, sovereignty, or independence. Yatsenyuk made the statement after talks with U.S. Secretary of State John Kerry, who was also in Kiev on February 5. After talks with Poroshenko, Kerry said Washington supported diplomacy, but "cannot close our eyes to Russian tanks crossing the border" into Ukraine. He said: "Russia's continued aggression in the east" is the gravest threat facing Ukraine today. Kerry demanded the immediate implementation of a September cease-fire deal and the withdrawal of all Russian troops and weaponry from Ukrainian territory. Kerry brought $16.4 million in new humanitarian aid to Ukraine. He said that U.S. President Barack Obama will decide soon whether to provide Ukraine with lethal weapons to fight the separatists. In Washington, Republican Senator John McCain said U.S. lawmakers would write legislation requiring the United States to send arms to Ukraine if Obama does not do so. White House spokesman Josh Earnest meanwhile said that the United States continues "to be supportive of ongoing efforts to try to find a diplomatic resolution" to the crisis. Russian Foreign Ministry spokesman Aleksandr Lukashevich has warned that any U.S. move to send weapons to Ukraine would cause "colossal damage" to Russian-American ties. Germany and other European nations remain fiercely opposed to sending arms to Ukraine. The top NATO commander, U.S. Air Force General Philip Breedlove, said on February 5 that Russia continues to supply the separatists with heavy, state-of-the-art weapons, air defenses and fighters. Breedlove also cautioned that any move to give Ukraine lethal defensive weapons "could trigger a more strident reaction from Russia." Meanwhile, NATO on February 5 agreed to immediately set up six command posts in eastern Europe and establish a spearhead force of 5,000 troops in response to Russian aggression in Ukraine. NATO chief Jens Stoltenberg said the force would be available to deploy within two to seven days in a crisis. The six command posts will be located in Bulgaria, Estonia, Latvia, Lithuania, Poland and Romania. The spearhead force will be backed up by two more brigades in order to keep reinforcements coming in a crisis. In total, the NATO response force will be increased to 30,000 troops from the current number of 13,000. On the ground in eastern Ukraine, a temporary humanitarian truce begun to allow civilians to leave the town of Debaltseve on February 6. Debaltseve is located within a narrow strip of land in the region of Donestk that is under Ukrainian government control in the midst of territory controlled by separatists. It has been the scene of heavy fighting for several weeks, with separatists pushing forward with an offensive they say is aimed at controlling the entire Donetsk region. Meanwhile, the Ukrainian military said the rebels have carried out more than 100 attacks on army positions in eastern Ukraine over the past 24 hours, killing two soldiers and wounding 26 others.